When it's essential to your business that your out-buildings offer maximum protection, with the most usable space anywhere, you can turn with confidence to American Steel Span. American Steel Span portable buildings are ideal for the agricultural market. Portable steel buildings rank highly for storing grain, housing livestock or protecting machinery and other farm equipment. 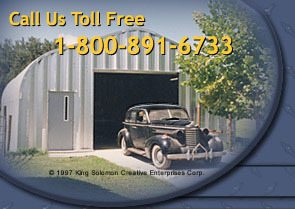 These portable buildings are versatile, come in widths up to 100 feet and are easily expanded to unlimited lengths. Studies of portable buildings show that the panel life of American Steel Span buildings exceeds 40 years. Panel crimps are closer together and smaller in depth virtually eliminating buckling problems and increase the strength of portable building panels by 25%. Economical as well as extremely durable, these portable buildings have received Florida testing approval for use in areas with high wind velocity, up to 150 mph.